Tooting sits betwixt the beginnings of the posh Home counties and the `inner London’ urban sprawl of Brixton and Peckham. Alive with multiculturalism, it’s nowhere more so than in Selkirk Street, off Tooting High Road, inhabited by Halal butchers, local barber shops and Harrington’s Pie and Mash shop, the oldest business in SW17, 106 years old and still going strong. For the next six weeks, there you will find Mr Sweeney, Mrs Lovett and the rest, resplendent in Beverley Mason’s pie shop once again at nightfall reprising the doleful tale of the fictional barber whose thirst for revenge after transportation and gross injustice leads him to serial killing on a grand – and thanks to Mrs Lovett’s pies – culinary scale. As critics and public alike crammed into the 50-seat shop, we could never have dreamt quite how alarming or effectively director Bill Buckhurst had corralled his hugely experienced cast into a postage stamp acting space. Tooting Arts Club may have no actual theatre venue, peripetically turning up wherever a venue presents itself. But as Buckhurst credits show, his is professionalism of the highest order. By turns lurid, powerful, touching – Sweeney contains some of Sondheim’s most lyrical writing in `I feel you Johanna’ as well as some of his most bleakly true and witty (`the crunching sound, you hear, my dear, is man devouring man’). 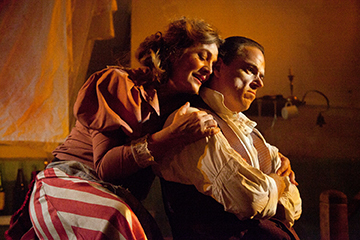 Buckhurst is blessed with the towering, glowering figure of Australian Jeremy Secomb as Sweeney and the delicious Siobhán McCarthy as Mrs Lovett. Add to that Nadim Naaman’s sweet tenor voiced Anthony, Kiara Jay as a very funny female Adolpho Pirelli, barber and charlatan, and gruffly fine and sinister accounts of Justice Turpin and Beadle Bamford alongside younger cast members and you have a wholly exceptional, unforgettable performance. Three musicians – Benjamin Cox piano, a clarinet and violin – provide a small but magnificent musical service. But the whole production conveys professionalism married to local endeavour and enthusiasm that is nothing short of triumphant.